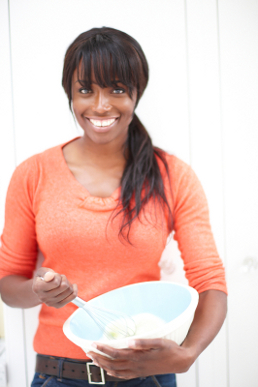 TV chef Lorraine Pascale talks to Liz Parry about how she keeps fit and healthy, plus her new approach to baking the lighter way. TV chef Lorraine Pascale is well known for her cookery shows and books, but she initially rose to fame as a catwalk model. Lorraine enjoyed a lucrative modelling career and became the first British black model on the cover of American Elle. However, looking for a change of career, the 41-year-old mum-of-one retrained as a chef, working in some of the most renowned kitchens of the world, before starting her own business creating celebration cakes. Lorraine’s TV shows Baking Made Easy and Home Cooking Made Easy both have accompanying books. Q: Lorraine, what prompted you to make the switch from modelling to cookery? Had you always enjoyed cooking? Lorraine: "I’d always enjoyed eating! I hadn’t done a lot of cooking though. I wanted to do something different to modelling as I knew that I couldn’t model forever, so I started to do different courses. It took a while to find what I wanted to do – there was a lot of trial and error. But when I did a cookery course I fell in love with it and I thought “this is what I have to do”." Q: Do you have a favourite dish that you like to cook? Lorraine: "I like to make quite simple meals; things like grilled chicken with salsa or steak with salad. When I’m coming in from work and want to make something quickly it will be food like that"
Q: Where do you get your inspiration from for your dishes? Lorraine: "Mostly from eating out and experimenting with different cuisines and flavours. Or throwing things together that aren’t traditionally meant to go together. I like to take classic dishes and make them a bit spicier. I love all different types of cuisine from Thai to French and Spanish. I’m also getting into Peruvian food as well. I love food with plenty of flavour." Q: Is healthy eating important to you? Lorraine: "There’s a time and a place for using things like fat and sugar in cakes and bakes, but yes, healthy eating is very important to me. I’m a low carb kind of girl so I make sure that I eat a lot of chicken and fish and plenty of vegetables. I also have a little bit of cake as a treat too! I think it’s important to be able to enjoy the odd brownie but not feel too bad about it." Q: Can you tell us a bit about your new book, A Lighter Way to Bake? Lorraine: "A lot of people love baking but want to stay slim and healthy, so I wanted to do a book that would embrace both of those things. The idea is to show that you can enjoy tasty recipes that are full of flavour but lower in fat and sugar. Each recipe has a comparison with a standard version so you can see the difference. It’s not just sweet recipes – there are plenty of savoury treats in there too." Q: How do you stay looking so trim? Do you do a lot of exercise? Lorraine: "Exercise is really important to me. I used to be a runner and I’d run about 6k three or four times a week but I found that I wasn’t really getting the results I wanted. It was only when I started doing strength training with light weights that I became much more comfortable with the way I am. Once you get over the age of 35 your muscle mass starts to diminish and that’s when the pounds start creeping on. Working out with light weights helps to build muscle mass, tones the body and also helps to burn fat much more quickly. I’ve converted lots of my friends into doing this. It works quickly and the results are amazing. It’s also a lot less effort than running!" Lorraine: "I take vitamin D, turmeric, glucosamine, calcium and the omega oils 3, 6 and 9. Those are the main ones. I do take other supplements as well but not every day." Q: Do you like to pamper yourself with spa treatments or therapies? Lorraine: "I love having massages and reflexology. I find that they’re both great for helping me to relax. I do a lot of writing and I can end up getting tension in my shoulders, so a good massage is great for sorting that out. I also find Japanese acupuncture to be really effective for balancing my health and wellbeing." Q: Will we be seeing you on our TV screens again soon? Lorraine: "Yes, I’ve just filmed a show for Sky called My Kitchen Rules which will be coming out soon. I’m also working on a documentary for the BBC on fostering. I’ve got quite a few things on the go at the moment!"